1 Position racks in upper and lower thirds of the oven; preheat to 375°F. 2 Coat tortillas on both sides with cooking spray. Place on 2 baking sheets. Bake, turning once, until light brown, 12 to 14 minutes. 3 Combine salmon, avocado and jalapenos in a bowl. Combine cabbage, cilantro and the pickling juice in another bowl. Process black beans, sour cream, salsa and scallions in a food processor until smooth. Transfer to a microwave-safe bowl. Cover and microwave on High until hot, about 2 minutes. 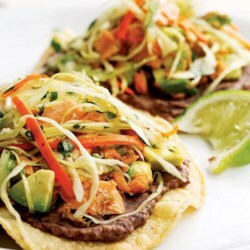 4 To assemble tostadas, spread each tortilla with some bean mixture and some salmon mixture and top with the cabbage salad. Serve with lime wedges, if desired. Kitchen tip: Look for convenient preshredded cabbage-and-carrot “coleslaw mix” near other prepared vegetables in the produce section of the supermarket.